al-Sanadi: We in the Al-Wefaq Islamic Movement announced the beginning of a new phase. We called this new phase ‘A fist in the field, and a grip on the trigger’. What we meant by a ‘fist in the field’ is the continuation of the popular demonstrations and protests, their continuation as they have been, as a (wide-spread) popular (movement). 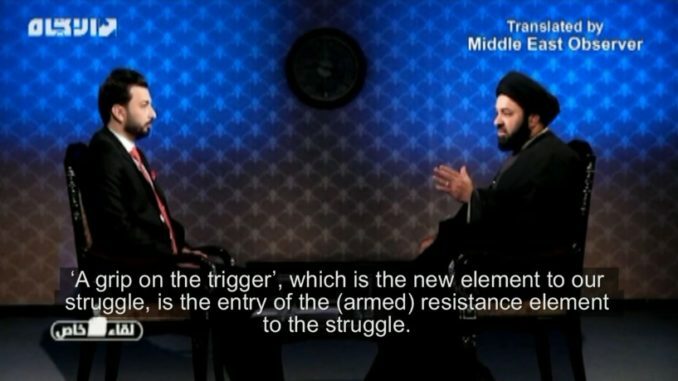 ‘A grip on the trigger’, which is the new element to our struggle, is the entry of the resistance element to the struggle. Host: Where did you derive the legitimacy for armed struggle? al-Sanadi: In terms of religious legitimacy, there are (grand) religious authorities who give legitimacy for this issue, and thanks to God there exist genuine (grand) religious authorities (today) who are influential and strong, and who give legitimacy in this regard. As you know, the Khalifa rulers and the Saudi occupation did not give us any opportunity to begin negotiating and to keep the peaceful movement as it is. Host: Was this idea translated on the ground? Host: And is guarded by Bahraini (personnel)? al-Sanadi: And is subject to high-level security (measures) carried out by Bahraini and Jordanian (personnel), it is heavily guarded, and is located in a remote, military area. The resistance and its heroes managed to head towards this prison and attack it, and to free 10 of the key prisoners being held there. There were also several other special operations, the Khalifa regime has admitted to the occurrence and impact of these special operations. Today we do not need to prove to anyone that the resistance in Bahrain is influential, it suffices for (people) to read the reports written by the Americans. Today, and since the launching of the (armed) resistance in 2017, we announced it on the 17th of January, 2017, from that time till today, there are dozens of reports issued by American institutions which admit and recognise that the resistance in Bahrain is a strong one, and is a resistance that poses a threat to American and British interests (in Bahrain), and poses a threat to the Khalifa (family) who control the state, and there are even some reports which say this resistance poses a threat deep inside Saudi Arabia, and that there are huge fears of this experience in Bahrain moving deep into Saudi Arabia. Host: What is your view, do you pose a threat to the internal depth of Saudi Arabia? al-Sanadi: I believe that all of Saudi Arabia – which came to Bahrain and violated its sanctities and carried out crimes against the Bahraini people, it is thus the right of the Bahraini people to respond (to these crimes) in the appropriate places and at the appropriate time. al-Sanadi: They consider it a threat, and we consider it our right to carry out at any time responses to the crimes committed against the Bahraini people.